Wildflower Cottage -A minutes walk from the beach! *Safe, white sand beach almost over the road! *French doors open off bedroom and lounge leading on to wrap around veranda. *Live music from visiting bands and locals at Luke's Kitchen through Summer and most Saturday nights throughout the year. *General store with huge ice creams and takeaways in village. *many other beautiful beaches within 5-15 mins drive e.g Otama,Opito, Matarangi and Whangapoua. *Whitianga also has supermarkets,shopping and a movie theatre. 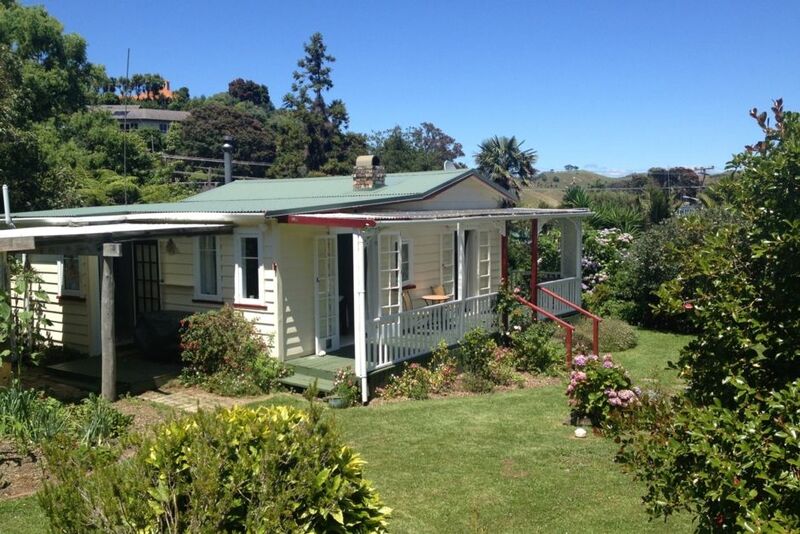 *You must acknowledge that there is a separate Garden studio on this property that may be rented at the same time. Everything you need is in the cottage. Very comfortable and home-ly. Not luxurious, but honest chabby-chic.....a true get away!! Wildflower Cottage is truly a relaxing place to stay with fantastic access to the beach. Our favourite spot was sitting under the grape vines on the balcony relaxing. Will be returning to this Gem. A comfortable homely place to stay. Well appointed - everything we needed for self-catering and a comfortable bed with good quality linen. A short walk to beautiful beach, shop, cafe/restaurant and home-made icecream. Kuaotunu is well located as a base for day outings to Whitianga, Coromandel, or just over the hill to Otama or Opito Bays. It was a pleasure to return to the cottage each day. Wild Flower Cottage is a beautiful home and so delightful to stay in. Wild Flower Cottage is a beautiful home and so delightful to stay in. It is a relaxed & cosy place and is nestled in an incredibly beautiful part of the world. Very well equipped with everything you need to have a thoroughly enjoyable stay.